I dream of the days, I can teach Zoe how to cook and hope she will enjoy it as much as I do. Cooking brings me so much joy because it reminds me of my dad. It has been several years since he has been gone, but it feels like yesterday, when I would go in the kitchen to watch him whip up a delicious meal. I wish I could relive those moments over and over again. As a parent myself, I look forward to creating new memories with my baby girl. She’s only two, so I am not really sure how she feels about cooking as of yet, but she does like to help out. I wanted to make something that would be fun for Zoe but does not require heat. I also needed to make sure whatever we would be making wouldn’t take a lot of steps. Two year olds have a short attention span. At least, mine does. 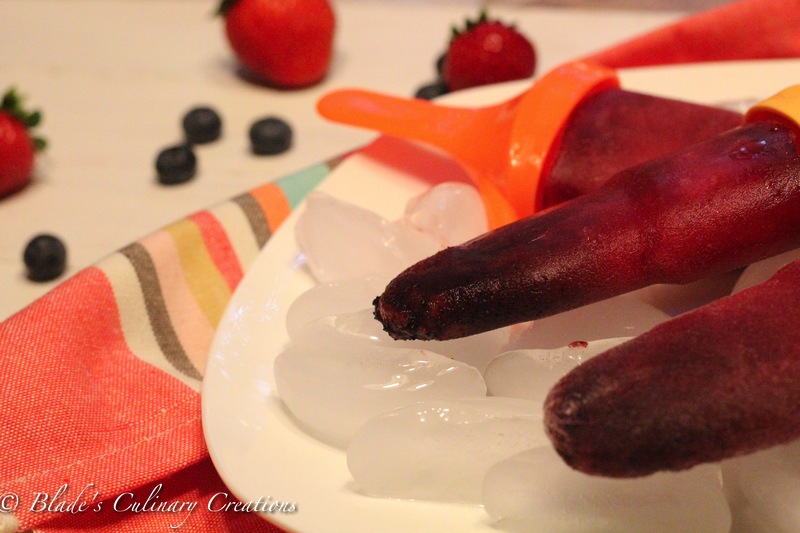 Ice Pops is something that does not require a lot of ingredients and does not take long to make (besides freezing). 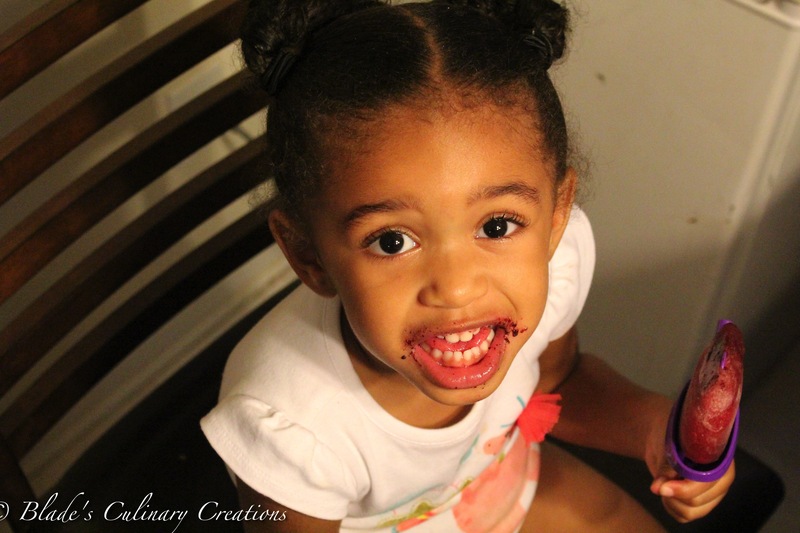 ***Warning *** If you are making Ice pops with a two year old, DO NOT, I repeat, DO NOT tell her that you are making Ice pops. She WILL harass you about them until they are frozen. That would be a LONG 4-5 hours. The good thing is I purchased a “ZOKU Quick Pop Maker” that will freeze your pops right in front of you. Nine minutes is better than several hours of a impatient kiddo. I will create a post soon on my pop maker when I make more Ice Pops. In the mean time, ice pop molds, ice cube trays, or plastic cups can be used for molds. Many different ingredients can be used to make this sweet treats. Be creative and have fun with it. In a blender, combine strawberries, blueberries, and raspberry lemonade. Blend until smooth, for about 30 seconds. Stir in simple syrup & lemon zest. 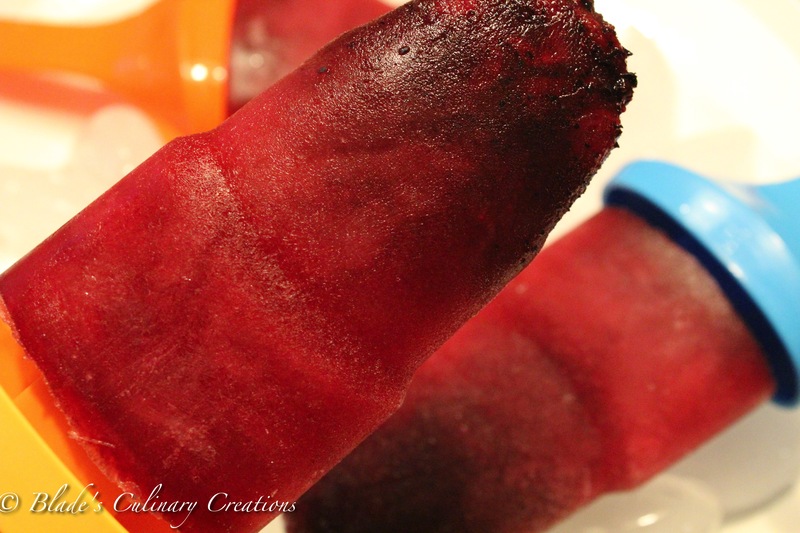 Pour mixture into ice pop molds and freeze 4 to 5 hours. In a medium saucepan, combine raw sugar and water. Bring to a boil, stirring, until sugar has dissolved. Cook for about 10 minutes. Allow to cool. She tore those things up Jay!